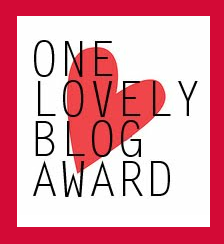 Thank you to Rachel over at Mummy In Training for nominating me for the One Lovely Blog Award. I didn't know about the award so I googled it and found out that it is given to you by fellow bloggers. 1. I went travelling when I was 18 years old with my now husband for 3 months to Hong Kong, Australia, New Zealand, America and Mexico. 2. I love to bake and when I do bake I don't just make one thing I literally bake a whole bakery! 3. I have 2 sons, Finley and Noah, and they are my entire world. I have always wanted to be a mummy and they made my dreams come true. 4. In the past year I have lost 2 stone which I am really proud of myself for. I have always been rubbish at dieting so I started on Slim Fast and went from there. I am the happiest about myself that I have ever been. 5. I love Costa, not sure why but I am obsessed with a Costa Coffee. So much so I swapped my Dolce Gusto for a Tassimo so I could make Costa's at home. 6. I have been with my husband over 10 years, since I was 17. It took him 6 years to propose but once he did we got married and had the boys within 3 years! 7. I did a sky dive when I was 18 in New Zealand and loved it - I would do another one if I got the chance. Thank the blogger who gave you the award, Share 7 facts about yourself and nominate 10 blogger for the award. I love you boys names! Also love your commitment to the Costa ;) Thanks for me nomination hun.